Wed., Oct. 17, 2018, 8:06 a.m.
A GRIP ON SPORTS • Baseball suckered me in last night. Like a zombie emerging from a grave, the Dodger/Brewer game grabbed me by the ankle and held on for strike out after strike out. Finally it ended with a celebration worthy of a successful revolution. Read on. • When Kim and I returned to the house last night at about 9:30, the National League game was still in progress. Little did anyone know it would still be going some two hours later. It was mesmerizing, in a lounge-act-hypnotist type of way. We were too busy clucking like chickens to get up and go to bed. So we watched Kenley Jansen pitch. And then we watched a bunch of guys who are known only to scouts, managers and folks who compete in 12-team keeper fantasy leagues. All of them threw 120 miles per hour, had sliders sharper than Wisconsin cheddar and the ability to paint the edges of the strike zone. At least that’s how the hitters made them seem. There once was a time when hitters swore they didn’t guess (they were lying). Now it seems everyone is guessing on every pitch and swinging out of their … pants. It only seemed a matter of time before somebody ran into a 94-mile-per-hour fastball and sent it to South Pasadena. But no one did. The game-winning run in the 2-1, 146-inning game came about due to a lined single to left, a wild pitch and a ground single to right. Imagine that. Small ball. And then every guy who ever wore a Dodger uniform this season rushed into left field (left field?) 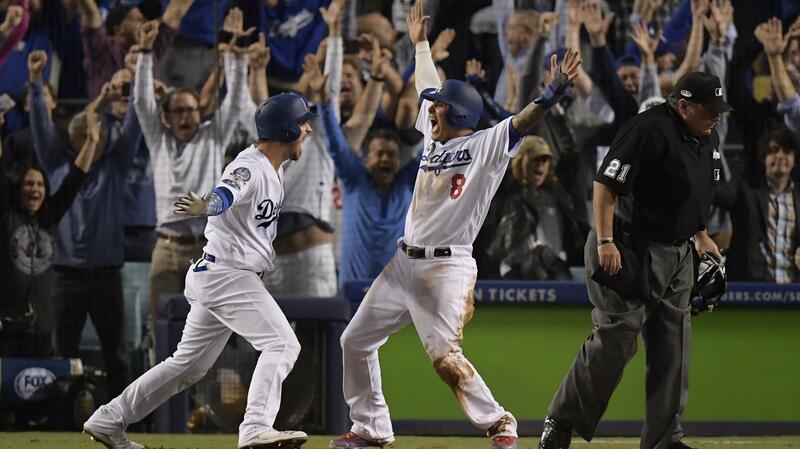 where the game-winning hitter, Cody Bellinger, was jumping around as if he just found out he was named prom king. In middle school. Then he stripped off his shirt. I am actually OK with celebrations. 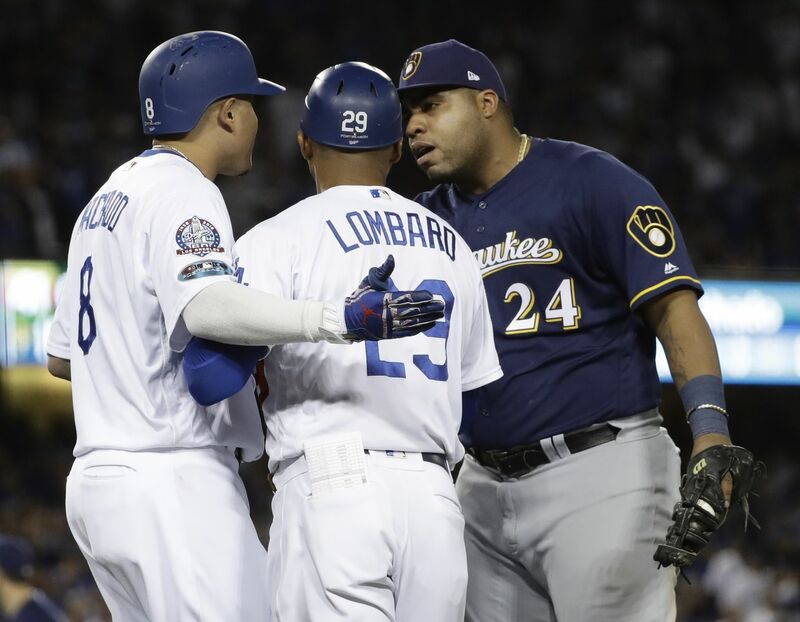 The whole act-like-you’ve-been-there attitude has gone the way of the 300-win pitcher and that’s fine. Times change. Roll with it. But it seems at times, and last night was one of those times, as if the celebrations are done more out of a sense of obligation than desire. It’s almost as if it’s a competition that has to be won – let’s do more than are opponent can ever do – than it is an organic commemoration of a hard-won victory. Why else would a player who just won a game with a single run all the way out to medium-deep left field for a magic gathering? It makes me wonder if, in the not-so-distant future, Bellinger or someone wins the World Series with a walk-off topper in front of the plate, they will run out to centerfield, climb into a Harrier jet and perform a fly-by around the scoreboard. All the while a tanker dumps Gatorade on their plane. You know, a spur-of-the-moment thing. Of course, they will land, get out and tell the world how blessed they are to be able to play with these guys – one of whom is sneaking up behind to bathe them in canola oil or confetti. WSU: As the College GameDay trucks roll on toward Pullman, the city is still abuzz. But yesterday it was abuzz with thoughts of the football game that accompanies the show. Theo Lawson talked with three players, Gardner Minshew, Nick Begg and Kyle Sweet after practice, as well as Mike Leach. The players say it is business as usual this week. … Theo also has his Pac-12 power rankings and a story on Rodrick Fisher dealing with his legal problems. … Sports editor Ralph Walter dreams up a scenario that has as much chance of coming true as any of us winning the big PowerBall jackpot. … Oregon will be without its usual starting left tackle Saturday. But the Ducks’ quarterback will be ready. Elsewhere in the Pac-12, the conference is dealing with some high-profile injuries. … The Huskies have to refocus after their playoff goal was smashed in Eugene. Colorado is also coming of a deflating defeat. … California is coming off three consecutive deflating losses, which gives a rested Oregon State and Jermar Jefferson hope. … Stanford and Arizona State meet Thursday in Tempe, with the Cardinal missing some key players and the Sun Devils showing better than most anticipated under Herm Edwards. … Arizona will not have Khalil Tate when it faces a resurgent UCLA group. … The South may be decided when Utah and USC meet. Though it might have been decided in the replay booth a few weeks ago. Gonzaga: Zach Norvell Jr. made the preseason Jerry West watch list. Jim Meehan has that story and he talks with Larry Weir for the most recent Press Box pod. … A GU women’s tennis player recently did something no other Zag has ever done. Kendra Andrews has the story of Sophie Whittle’s accomplishment. EWU: Around the Big Sky, Weber State moved back into the top 10. … Montana State knows the Wildcats feed off turnovers. … Idaho State is trying to figure out what went wrong last week. … Southern Utah has a lot of new faces playing in key spots. … How will the Montana players deal with their bye week? Chiefs: Spokane handed Brandon a 6-4 loss last night as the Chiefs’ long road trip continued. … Everett is also off on its long road trip. Preps: The slowpitch regular season ended yesterday, with U-Hi finishing an undefeated season. … We also can pass along roundups from soccer and volleyball. 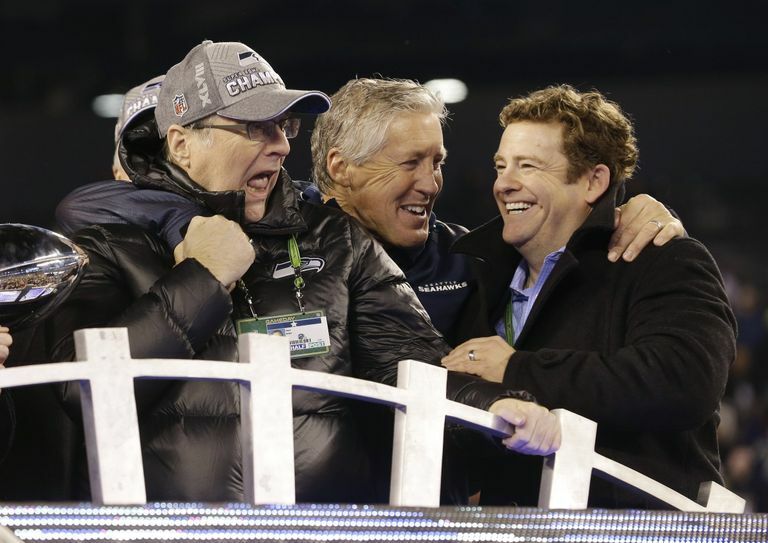 Seahawks: With Paul Allen’s death, the Hawks' future off the field is up in the air. … It’s obvious the Seattle players liked the franchise owner. … Pete Carroll is positive his team is on a roll. Mariners: The M’s are stuck in the middle of the American League. Getting out won’t be easy. Sounders: Seattle can clinch a playoff spot this week. Published: Oct. 17, 2018, 8:06 a.m.